As winter settles into the Pavin Weald, and the moon begins to wax toward full, Forest Folk prepare for the Wolfenmoot. Those who live in the woodland settlements of the northern Pavin Weald, the Forest Folk, live closely with the large packs of wolves in the forest. These packs are usually led by rhy-wolves who Awaken from their number, and who consider the packs their families and charges. As the moon rises on the first night of the Wolfenmoot, the rhy-wolves gather in the Mootglade, a clearing hidden away in the Pavin Weald, with a stone outcropping rising up from its center. This great edifice of silvery-white moonstone is said by the rhy-wolves to be a piece of the moon itself. The gathered wolves spend the early evening on the hunt, before returning to the Mootglade, to lounge on and around the outcropping. For the rest of that night, they exchange stories of their time among the Forest Folk: stories of those who’ve gone out of their way to aid the packs, and those who are kind to dogs and other animals. They also discuss those who’ve brought harm to them, who are greedy, wicked, or unkind to the packs or the other animals. They also share treasures with one another: some bring things they have found, baubles taken from poachers and thieves, or things made by the Gifts of those rhy-wolves with an inclination to create works of art. Then, on the second night of Wolfenmoot, the Forest Folk celebrate their wolfen neighbors, sometimes gathering as a community to tell stories and sing songs celebrating rhy-wolf heroes and the legends that have cropped up within the Pavin Weald. They return to their homes, to share a feast of roasted meat and slices of moon-cake. Once all the songs are sung, and bellies are full, the household goes to bed, leaving out shares of the roast for the Spirit of the Wolf. 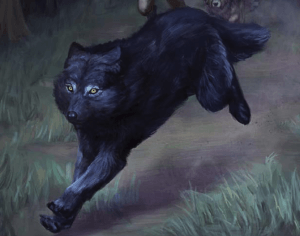 In the Mootglade, the rhy-wolves raise their voice in song, howling to the moon, and the eldest of their adepts call to the Spirit of the Wolf. A great wolf, the size of a horse, ghostly and glowing silvery-pale in the moonlight, steps out of the great moonstone outcropping. It raises its voice in a howl, which the others join, and then it disappears into a pearly mist, breathed in by the wolves at the moot. Their eyes glowing the silver color of the Spirit, they all dash off into the forest, each with a treasure in their mouths. The wolves travel with uncanny speed, covering many miles overnight. They arrive at the homes of the very best wolf-friends, and the Spirit allows them to step through walls as though they were mist. Quietly they creep through the home, each clutching a gift for those in the home. They enter homes in small groups, slinking through the shadows of the dwelling, leaving gifts in unexpected places. They then share the meat set out by the family, and then disappear back into the forest. Welcome to the World of Lazarus World of Lazarus: It’s Time to Organize!